Washington urges the EU to maintain sanctions on the terror organization as Hamas spokesman declares 'victory' in ruling. Hamas - not a terrorist organization? The United States on Wednesday urged the European Union to keep up its sanctions on Hamas, saying there was "no change" in US policy. 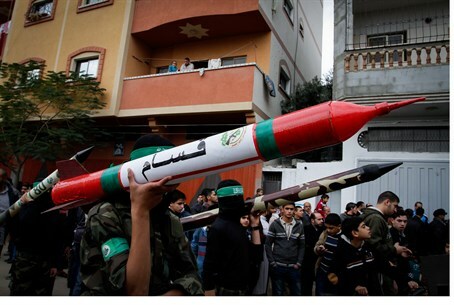 "The EU should maintain terrorism sanctions on Hamas," State Department spokeswoman Jen Psaki said, adding that the United States was studying a ruling by an EU court ordering that the Palestinian terrorist group be removed from an EU blacklist. "The US position on Hamas has not changed; Hamas is a designated foreign terrorist organization." "Hamas continues to engage in terrorist activity and has demonstrated its intentions during this summer's conflicts with Israel," Psaki added. "It fired thousands of rockets into Israeli civilian areas and attempted to infiltrate Israel through tunnels that extended into Israel." A European court ruled that Hamas - whose charter vows genocide against Israelis and who launched over 3,500 rockets at Israeli civilians over the summer during Operation Protective Edge should be temporarily removed from the bloc's terrorism blacklist on Wednesday. European officials scrambled to explain in the decision's wake that they still deem Hamas a terrorist organization and that the ruling was made for "technical reasons." "The EU continues to consider Hamas a terrorist organization," European Commission spokeswoman Maja Kocijancic said, adding that the EU would consider its response to the court's ruling, including the possibility of an appeal. Hamas's assets will remain frozen despite the ruling, and lawyers are expected to present a fresh case for Hamas's re-inclusion. Britain also said it wanted to maintain the terror listing, according to AFP. Its embassy to the EU said the judgement "does not change UK or EU's position on Hamas, a terrorist group." Nonetheless, the decision to remove Hamas from the list drew angry responses from Israel, including Prime Minister Binyamin Netanyahu, who fired that Europe had "learned nothing" from the Holocaust. "It seems that too many in Europe, on whose soil six million Jews were slaughtered, have learned nothing," Netanyahu said, demanding that the EU reinstate Hamas on the list. "But we in Israel, we've learned. We'll continue to defend our people and our state against the forces of terror and tyranny and hypocrisy." Hamas has deemed the move a "victory." "This is a victory for the Palestinian question and for the rights of our people," Hamas spokesman Fawzi Barhum told AFP. "We thank the European court for this positive decision which must be followed by international steps to lift the oppression of the Palestinian people."